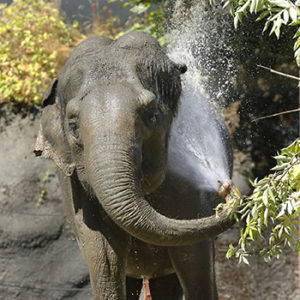 Conservation is at the heart of everything we do at Point Defiance Zoo & Aquarium. Since 2002, The Zoo Society’s Dr. Holly Reed Wildlife Conservation Fund has provided more than $2 million in grants to benefit a diverse range of endangered species from exotic Sumatran tigers to hammerhead and other sharks, to red wolves and walruses. Generous donations from The Zoo Society, Zoo members, guests and donors help us support protection of wildlife and wild places at home and around the world through scientific research, education, breeding programs, anti-poaching efforts, and other programs. Read the full 2018 report. In 2018, the Dr. Holly Reed Wildlife Conservation Fund awarded grants totaling $261,363 to 25 projects ranging from GPS units to help track the movements of polar bears in Canada’s Western Hudson Bay, sharks off Baja California’s Revillagigedo Islands and clouded leopards in Borneo; to funding anti-poaching efforts in support of endangered Sumatran tigers, elephants and other animals in Southeast Asia; to zoo-based research and conservation. The funded programs expand scientific knowledge of animals and the effects of climate change and habitat loss, aid Species Survival Plan® breeding programs and protect habitat that benefits individual animals as well as their species. Many shark species are declining around the world, but to protect them we need to understand them, and their habitat and behavior. 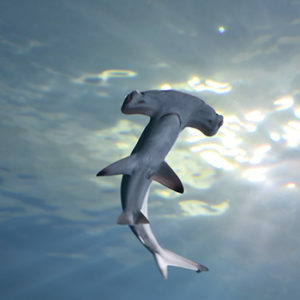 Our funding helps researchers from the Hawaii Institute of Marine Biology outfit 12 female scalloped hammerheads – the same species that we care for in our new Pacific Seas Aquarium – with acoustic and satellite tags, and obtain tissue samples for genetic analysis. We also fund scientists from the Fins Attached organization to tag hammerheads and other sharks off the coast of Baja, Mexico, playing a role in the government’s expansion of the protected marine area around the Revillagigedo Islands. Two Zoo aquarists have also participated in the tagging process. Finally, we’re funding study of blacktip sharks in the Gulf of California by the non-profit Pelagios Kakunja. This study helps understand key habitat areas to better manage fisheries and protect these sharks. All seven of the world’s sea turtle species are threatened or endangered. They eat plastic trash, get entangled in nets, are caught as bycatch or suffer poaching and habitat destruction. 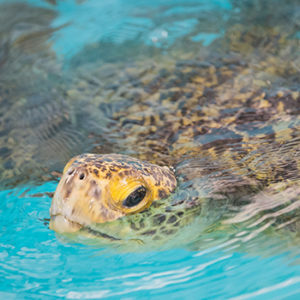 With two green sea turtles now making their home in the Pacific Seas Aquarium, we’re helping protect their wild cousins. We’re funding study of eastern Pacific green sea turtle feeding sites in Mexico, and we’re supporting over 250 volunteers in Maui, Hawaii as they patrol beaches at nesting season for hawksbill turtles, helping hatchlings make it safely into the ocean. Poachers are hunted and brought to justice. Tigers caught in snares are rescued and released. Wildlife Response Units work with villages to address human-tiger conflict and prevent illegal habitat loss. 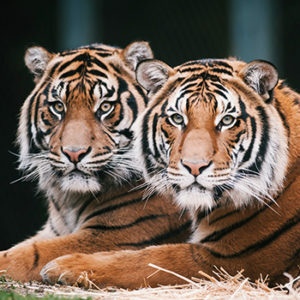 Only a few hundred Sumatran tigers remain in the wild on their native Indonesian island of Sumatra. Grants from the Dr. Holly Reed Fund help the Association of Zoos & Aquariums’ Tiger Conservation Campaign support this critical work to save a vanishing species. Last year, field units responded to 27 tiger-human conflicts and worked with communities to build 36 tiger-proof livestock pens. They also handled 12 cases of 31 suspects involved in illegal hunting and smuggling. They are shy. They are elusive. They are so difficult to spot in their rapidly disappearing natural habitat that no one knows for sure how many endangered clouded leopards remain in the wild. But it is universally acknowledged that the species is in trouble. Point Defiance Zoo & Aquarium works with partners across the nation to collaborate with zoological officials in Thailand on a breeding and research program that is crucial to continued research and understanding of these exotic cats. 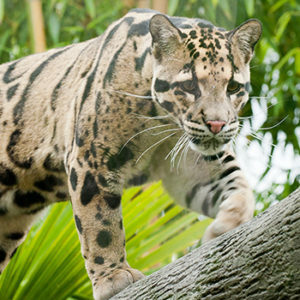 In addition to that work, conducted by the Clouded Leopard Consortium, grants awarded this year will support studies of camera-trap data so scientists can learn more about the animals; the purchase of GPS collars to track clouded leopards translocated in Malaysia; and an analysis of clouded leopards, their prey, and their threats in Bangladesh. All this work helps guide future efforts to save this endangered species. Rapid conversion of Sumatran elephant habitat for development has led to increased contact between people and wild elephants. A Dr. Holly Reed Fund grant supports work being done by Conservation Response Units in the Way Kambas National Park of Lampung Province, Southern Sumatra, to address these conflicts. Formerly neglected elephants are trained to carry forest rangers into elephant territory to fight crime, rescue wildlife, reduce elephant-human conflict by herding wild elephants away from settlements and provide education and outreach programs to villages in and around the parks. As climate change intensifies, polar bears are increasingly threatened. These massive mammals depend on sea ice platforms for catching the seals that are their main source of food. And through a portion of their range, polar bears live on sea ice year-round. But in Western Hudson Bay, the sea ice melts entirely during the summer. The bears are forced ashore for extended periods and without their natural prey must fast for up to five months. As ice melts earlier in the summer and freezes later in the fall, the bears spend more time on the mainland, hunting for food and coming into contact with human settlements. Researchers will employ up to 40 GPS ear tags on adult male and young male and female polar bears. The data collected will help scientists work to reduce human-bear conflicts and make informed decisions on future conservation action. The researchers long have worked with Polar Bears International (PBI). 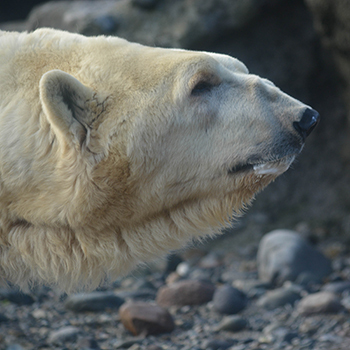 Point Defiance Zoo & Aquarium is an Arctic Ambassador Center and works closely with PBI to tell the story of polar bears and the mounting challenges they face in the wild. Read our blog story here – and check out the PBI Bear Tracker to see the movements of a number of female polar bears whose movements are regularly tracked. Dr. Holly Reed was a beloved staff member and veterinarian at Point Defiance Zoo & Aquarium from 1995 to her death in 2012 from breast cancer. She volunteered her veterinary skills around the world, including Polar Bears International and Asian elephant conservation in Sumatra. Help us keep Dr. Reed’s memory alive by supporting the Zoo Society’s conservation fund that bears her name.